North Korea is giving markets the jitters again. Stocks in Asia and Europe dropped after Kim Jong Un's regime fired a missile that flew over Japan before falling into the Pacific Ocean. South Korea's benchmark Kospi index fell more than 1% in early Asian trading Tuesday, but recovered some ground to close down 0.2%. Japan's Nikkei shed 0.5%. Markets in Europe opened sharply lower, with indexes in London and Paris losing roughly 1%. U.S. stock futures showed that benchmark indexes were poised to lose between 0.5% and 1% at the open. Japanese Prime Minister Shinzo Abe called the launch a "serious and grave" threat to his country, a key U.S. ally in the region. Analysts said the situation over North Korea remains a concern for investors. "It is going to move back into the headlines and be a cause of volatility for the market," said Art Hogan, chief market strategist at Wunderlich Securities. Gold, which tends to benefit from market fear, rose 0.9%. The Japanese yen, a safe haven currency, added 0.8% against the U.S. dollar. The missile, which was fired just before 6 a.m. in Japan, prompted warnings for residents in the region to seek shelter. 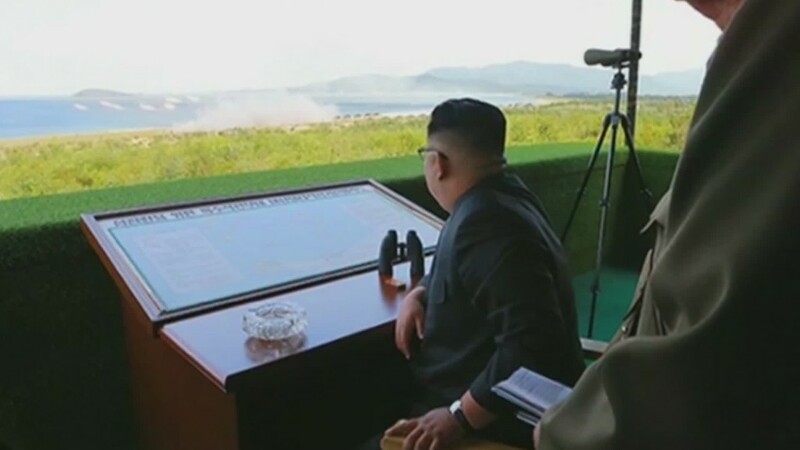 South Korea responded by conducting a bombing drill to test its "capability to destroy the North Korean leadership" in cases of emergency, an official with the country's Defense Ministry said. This launch comes only days after Pyongyang fired off three short-range ballistic missiles in the midst of U.S. and South Korean military exercises in the region. Earlier this month, a war of words between President Trump and North Korea unsettled markets around the world.